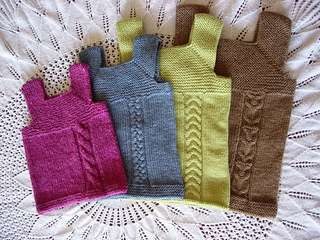 In my last post I said that I was taking part in the Indie Designer giftalong both as a designer but also as a knitter. So what about the knitting? Well I could be accused of being a little predictable with this, my first Giftalong pick. 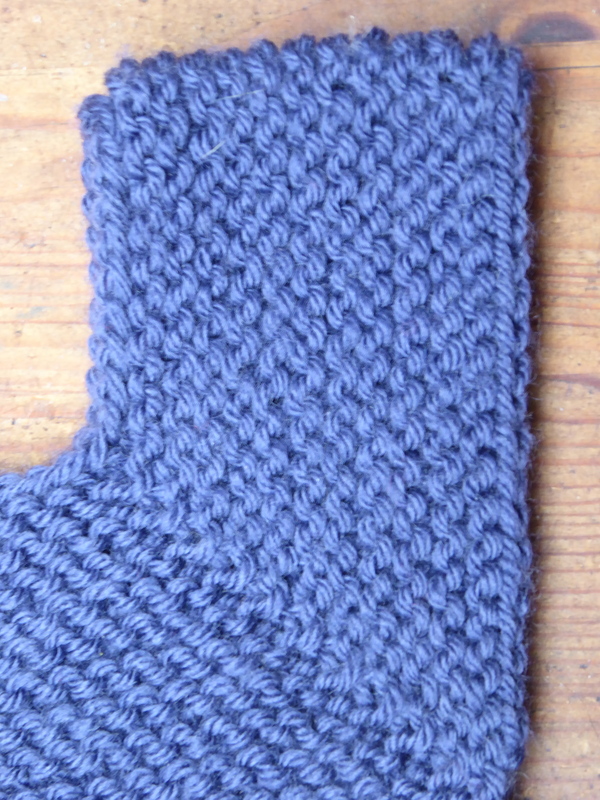 It’s a pattern I’ve knitted a number of times and I just can’t say enough good things about it so I’ll just list few. Knitted top down in the round there is minimal finishing, which is great if you’re tight on time because if you’re anything like me you underestimate the time it take to sew in ends, sew up seams, sew on buttons etc. It’s sleeveless – again great if you’re pushed for time as sleeves always take longer than I expect – is a theme of last minute panic knitting developing here? It’s worked in DK yarn – who doesn’t have a couple balls of DK in their stash? You can modify it by either choosing your own cable or textured stitch pattern or by creating stripes – which also makes it great for leftovers. There’s a great little tip and tutorial for casting off your stitches and keeping the corners neat when you cast of some stitches in your round. 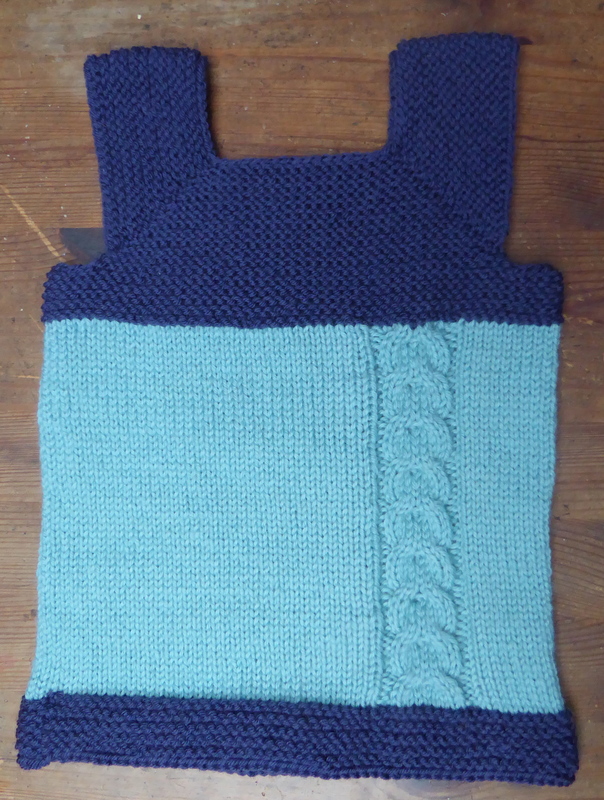 I love that you are told to use the long tailed cast on – it’s only when you cast off to make the shoulder straps/armholes that will you see how perfectly the cast on and cast off match up – I love that kind of attention to detail. But I think the main reason I like Milo is because it always look fabulously cute on little ones. If you take a small person who you think is pretty cute – you’re allowed to be biased here – and put them in a Milo – despite being absolutely sure that nothing could make them cuter than they inherently are, I challenge you not to be completely bowled over. I’ve knitted my Milo in Rowan Pure Wool DK in the one year old size. 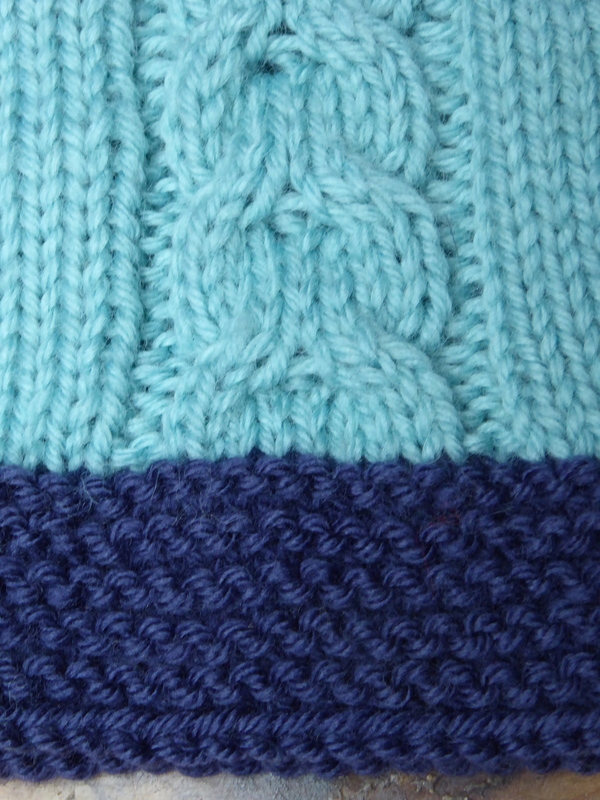 It took one ball of the dark blue and one of the turquoise – I had some left over of both and more exact yarn usage is on my Ravelry Project page. I used the dark blue at the top as I thought this may be where the grubby things happen and turquoise in the middle to show off the cable. I also finished the bottom on a knit row then cast off so that the edge would match the edges at the shoulder and armholes that I raved about above, and you can just make out in the picture below. This is destined for my great nephew who was born earlier this year – this is my second time being a great aunt – a title that both scares me and makes me feel immensely proud, and that also makes me think I should be a great deal wiser than I am.